A hybrid of musical styles permeates throughout the life of German artist Max Baumann. 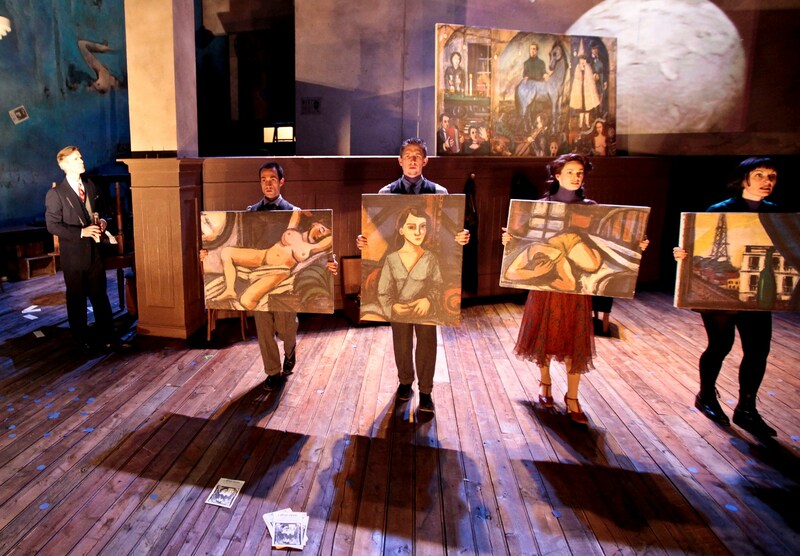 That is, in the Weimar-era production of The Blue Flower that’s currently playing in music-hall format at the American Repertory Theater in Cambridge, MA. Surprising flourishes like German cabaret, the yearning pop ballad and some country twang sprout up like the flower motif the show evokes. THE BLUE FLOWER currently running at the A.R.T. To prep you for an atmospheric German experience, the theater lobby is set up like a casual beer garden, complete with picnic and cafe tables topped with glass beer bottles and battery-0perated tea candles. A concession kiosk has been brought in serving your choice of potato pancakes, sauerkraut and wieners (shhh, American hot dogs). The house inside transports you back to a vintage 20th century saloon hall with musicians to the side of the stage warming up their instruments. The period stage design by Marsha Ginsberg is riddled with those ornately-crafted wooden highback chairs and an assortment of broken mannequin limbs. Just some derelict pieces and artifacts that can be found at war-torn establishments like these. The story is an inspiration of four real-life historical figures that parallel the fictional characters: Max Beckmann, Franz Marc, Hannah Höch and Marie Curie. They were all led by one common mission, to serve their country during the war. Entirely conceived and developed by the husband-and-wife team of Jim and Ruth Bauer, the scope and ambition is something to be said for a show that was created by first-timers. Avant-garde and unique, yes, but you sense that the Bauers have done musical theater all their lives. Coming instead from the world of visual contemporary art, they were drawn to the artistic movements of Surrealism and Dada, and the playfulness and restlessness of how art is presented. The concept of the “blue flower” is their approach to the elusive search for artistic perfection. Since undergoing several workshop incarnations from 2001, it can benefit from a little cohesiveness of the diverse musical idioms and some clarity into the time shifting. Presented as a fragmented multimedia collage that intercuts among scenes of Baumann’s various life events, starting with him speaking in his made-up gibberish language, Maxperanto, the structure travels to his days as a war medic, to his lectures as a visiting professor at universities. The onstage band led by Mark Rubenstein accompanies the stage action with finesse with his ensemble laying out the notes so lushly. The songs by Jim Bauer naturally become melancholic and melodic accents for the talented cast singing wistfully in some sections. Both Bauers created the video montages of war and abstract iconography being shown on a screen at the top of the stage, while Ruth, whose own artwork has been featured at the MFA Boston, among others, created the Baumann paintings seen in the show. As directed by Will Pomerantz, he has created a beautiful living portrait and an artistic assemblage of an artist that has certainly touched the Bauers. It is meant to evoke remembrances and the longing it creates for a bygone era. But as Pomerantz suggests, it is also possible to move forward and create the better times for those future memories. The real-life Max Beckmann created a legacy of Expressionistic painting after his death in 1950. His paintings as inspired by the Blue Flower should and will continue with the desired life of a future collective memory.